You may order chord studies for the Jazz Standards listed below. 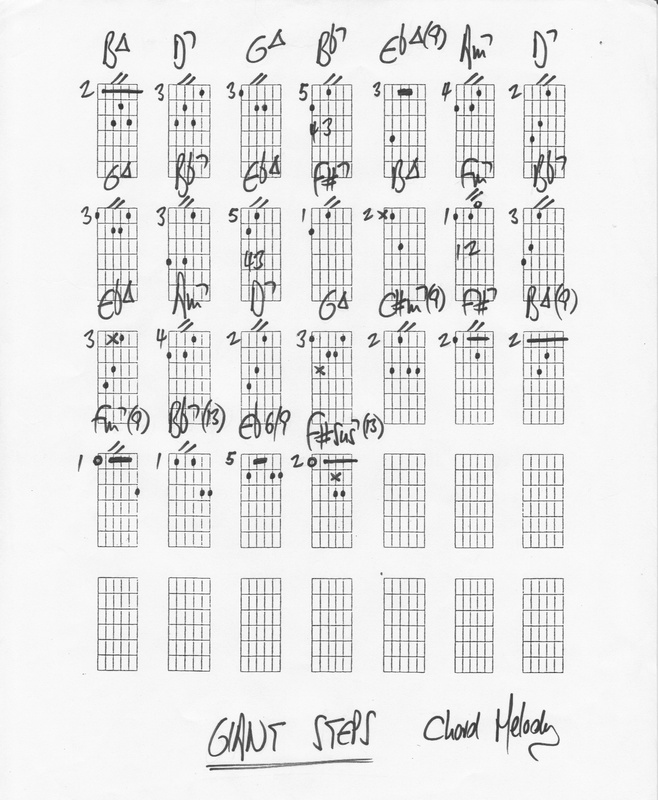 All chord studies are written in diagram form (similar to the ones already presented on this website). Chord studies are listed either as "Chord Melody Arrangements" (the melody of the song, harmonized) or as "Comping Studies" (the chords we might play to accompany another soloing instrument). All studies come in pdf format and will be e-mailed directly to you within 24h. Order 3 Chord Studies (1 Harmonized Melody + 2 Comping Studies) for "All Of Me". Order 1 Harmonized Melody for "Autumn In New York". Order 4 Chord Studies (Comping Studies) for "Autumn Leaves". Order 2 Chord Studies (Comping Studies) for "Black Orpheus". Order 1 Harmonized Melody for "Blue In Green". Pack #1: Order 5 Beginner/Intermediate level Chord Studies (Comping Studies) for "Jazz Blues in F". Pack #2: Order 5 Intermediate/Advanced level Chord Studies (Comping Studies) for "Jazz Blues in F". Pack #3: Order 5 Beginner/Intermediate level Chord Studies (Comping Studies) for "Jazz Blues in Bb". Pack #4: Order 5 Intermediate/Advanced level Chord Studies (Comping Studies) for "Jazz Blues in Bb". Order 2 Chord Studies (Comping Studies) for "Bluesette". Order 1 Harmonized Melody for "Body And Soul". Order 1 Harmonized Melody for "Don't Blame Me". Order 3 Chord Studies (Comping Studies) for "Fly Me To The Moon". Order 7 Chord Studies (Comping Studies) for "Giant Steps". Order 5 Chord Studies (Comping Studies) for "How High The Moon". Order 3 Chord Studies (Comping Studies) for "Ladybird". Order 1 Harmonized Melody for "Like Someone In Love". Order 4 Chord Studies (Comping Studies) for "Mack The Knife". Order 1 Harmonized Melody for "Naï¿½ma". Order 3 Chord Studies (Comping Studies) for "Night And Day". Order 3 Chord Studies (Comping Studies) for "On Green Dolphin St". Order 2 Chord Studies (Comping Studies) for "Out Of Nowhere". Order 1 Harmonized Melody for "Prelude To a Kiss". Order 4 Chord Studies (Comping Studies) for "Rhythm Changes". Order 4 Chord Studies (1 Harmonized Melody + 3 Comping Studies) for "Satin Doll". Order 2 Chord Studies (Comping Studies) for "Scrapple from The Apple". Order 5 Chord Studies (Comping Studies) for "Solar". Order 3 Chord Studies (Comping Studies) for "There Is No Greater Love". Order 5 Chord Studies (Comping Studies) for "There Will Never Be Another You". Order 3 Chord Studies (1 Harmonized Melody + 2 Comping Studies) for "Tune-Up".